Blazing Hot Wok: Meat on a Stick: Panang Cocktail Meatballs! 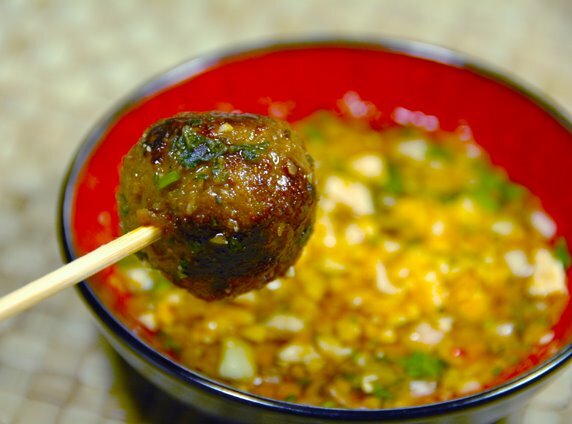 Meat on a Stick: Panang Cocktail Meatballs! I just had a very fun night with an awesome bunch of women—all affiliated with Portland’s vibrant food scene! When my neighbor asked me to join them, I felt a little intimidated because I was going to be in the company of café owners, restaurant owners, caterers, chefs and photographers—you know, professionals. Women who know their stuff. I have to say, though, I was put at easy very quickly. Everyone was so friendly and it was fascinating to hear their stories. I came away with a lot of great information. Thank you so much to my neighbor for inviting me! There was another reason I was feeling intimidated. Two words: appetizer potluck. What does a food enthusiast (=amateur) bring to a potluck for a bunch of women who know their stuff? What else but meat on a stick and dipping sauce, of course! Because professionals or no, everyone likes meat on a stick. And what's the fun of eating meat on a stick if you can't dip it in something? To begin, set a large pot of water to boil. You may be wondering why? Because you are going to boil these meatballs. Boil meatballs!? Yes! And then you’ll stir-fry fry them. Sounds convoluted, I know, but trust me on this. When have I lead you astray? You may cook the curry paste by frying it over low-medium heat in about a tablespoon of oil for about 5 minutes. This is not necessary, but it helps to enhance the flavor of the curry paste. In a large bowl, scramble the eggs, then slowly add in the cornstarch and whisk until it’s well incorporated. Add in the curry paste, fish sauce, sugar and chopped lime leaves. Mix until you get a uniform mass. Mix in the ground beef and make sure it’s thoroughly incorporated. Form into mini-meatballs and plop them into the boiling water. They conveniently float to the top when they are cooked. Fish them out, drain them and let them cool, at least until they stop steaming. One last step before you’re done! In an ideal world, I would grill these babies over low heat, but trying to start a fire in the rain is just stupid. The second best option is to stir-fry the meatballs to get a nice caramelized outside, while the inside remains moist. During the last minute of stir-frying, I drizzled in some sweet-sour glaze (simple syrup + rice vinegar, to taste) and chopped Thai basil (optional). Alternatively, you could use Thai sweet chili sauce. If you don’t feel like stir-frying you could just as easily stick them under a broiler for a few minutes, turning every so often, until they start to brown. Serve stuck on skewers with accompanying dipping sauce. How'd you score that invite? That's awesome! Mmmm...meatballs. All my restaurant pals...heck, all of my friends...LOVE meatballs! And with that dipping sauce, I'm guessing yours went over huge. Nice job! The thing most people don't get is that in my experience most restaurant owners/chefs/food people who come for dinner just want to eat good food. It doesn't have to be anything fancy. That's very cool you were able to join that group! bb, one restaurant owner chose to bring wine instead of food because, well, she cooks all day. The chance to enjoy great food and not have to cook it? Sign me up! What an opportunity! I think you picked the perfect dish for the potluck. I'll bet your meatballs were gone in a flash. Did anyone else bring a dish you found extraordinary. Mary, yes! There were these wonderfully light, savory pastries with Gorgonzola and walnuts and grass-fed bison sliders with caramelized onions. First time I'd tried bison and it was very delicious. Not at all gamey or dry. The bison came from a relatively young ranch in central Oregon called Powell Butte Bison Ranch. Unfortunately, they don't have a site up yet, but I think they are working on that. Want one of those right NOW! Rebekka, they are so easy to make. Just get yourself the ingredients and in less than hour, you could be feasting! Great technique: I'm going to have to try that soon. Thanks! js and ts, it's convenient that the meatballs float to the top when they're done. I think it's because of the cornstarch? ?